Stay hydrated. Walk around the cabin at regular intervals. Stretch and exercise. All good advice for surviving a long distance flight, but I was too busy playing Advance Wars: Dual Strike. 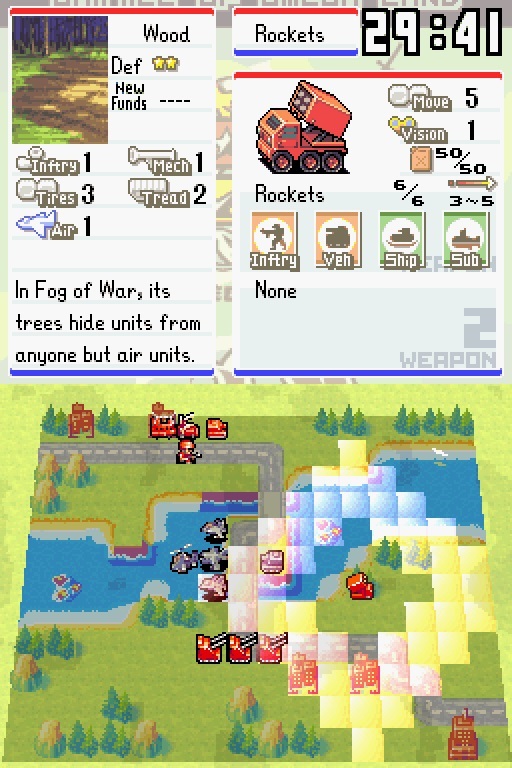 Advance Wars: Dual Strike (2005) is one of two Nintendo DS installments (Advance Wars: Days of Ruin is the later, darker entry) in the long-running “Wars” series that began with Famicom Wars in 1988. 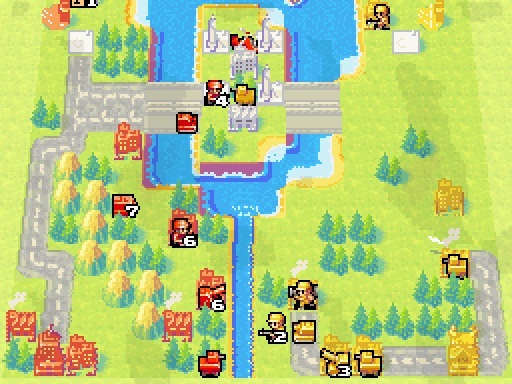 Developed by Intelligent Systems, the Nintendo subsidiary responsible for the Paper Mario series as well as programming duties on other classic games, Advance Wars: Dual Strike is one of the DS’ earliest and strongest games, an outstanding turn-based tactics title that compels you to give it “just one more go”. Mission objectives vary, but fundamentally the goal of Advance Wars is to defeat opposing armies by either routing all their units or capturing their headquarters. To do this, players (human or computer-controlled) each take turns to move troops and vehicles across a board game-like map in an effort to conquer cities and destroy enemy units. Advance Wars: Dual Strike takes advantage of the Nintendo DS’ dual screens to display the level in play on the bottom, and highlight details on your current selection up top. As you might expect for a Nintendo/Intelligent Systems game, this is not a self-serious take on modern warfare. Troops, tanks, jets, and battleships are rendered in a colorful retro style. Intelligent Systems has fun with national stereotypes too – Max is a brawny all-American Commanding Officer, while Blue Moon forces are Russian oligarchs (their special moves: raising and spending war funds). The humor is good-natured and the style is breezy, but underneath it all Advance Wars: Dual Strike is a deep tactical challenge. Why is this game so addictive? Advance Wars: Dual Strike is about digging into the details. Scanning the game map, clicking on each unit to assess its position and health/ammo/fuel levels, hedging against the range of enemy attacks, identifying and prioritizing targets – everything about Advance Wars is completely compelling. To master Advance Wars you have to embrace your inner micro-manager. You need to be comfortable with tactical planning, analyzing strengths and weaknesses, and balancing offense and defense. Each move of your armed forces has to mesh into a coherent effort to capture cities and factories, boost revenue, and create more soldiers and units. Every unit has its uses. Infantry units have limited health and movement (they can only march across three “squares” in one turn), but no other piece on this chessboard can capture cities, vital in generating funds for producing new troops and vehicles. You have a range of land vehicles at your disposal – armored personnel carriers can speed up troop movement, but are unarmed and defenseless. Tanks provide the firepower, but are easily bogged down in forests and unable to traverse mountain ranges. Consider the terrain – plains and roads leave you wide open to attack, while cities and mountains enhance your defense. Guerrilla warfare plays a part here, as enemy units can be stubborn to dislodge once dug into an urban or mountainous environment. Vehicles burn more fuel in cold conditions – one of countless factors that need to be considered in Advance Wars: Dual Strike. What about artillery, rocket and missile launchers? With these units you can pummel ground and naval forces, but heavy weapons can only be used “indirectly” – meaning the player cannot move and fire in the same turn. Combat also takes you to the air and sea, with a range of fighters, bombers, submarines, and battleships. So many factors to weigh – fuel-guzzling vehicles and aircraft that need resupplied; adverse terrain and weather conditions; enemy movements and potential counter-measures. Each and every move has limitless ramifications. If there is a criticism of Advance Wars: Dual Strike, it’s actually the hook of dual strikes – the ability to pair two Commanding Officers and launch “Tag Power” special moves that imbalance the finely-tuned gameplay. Battling on two fronts – using both DS screens – is also clunky, but thankfully these missions are rare. At an aesthetic level, Advance Wars: Dual Strike‘s crisp presentation makes it quick and easy for the player to scout terrain and troops. Intelligent Systems made effective use of the Nintendo DS’ two screens: with the stylus (or the D-pad) you can select units and make your moves, while the top screen displays detailed information on your current selection. The controls and interface are so intuitive that after a few games you’ll gain a gut feel for the state of your forces, without having to scrutinize stats. Advance Wars enables the player to make quick assessments and decisions, and the game clips along at a quick pace. 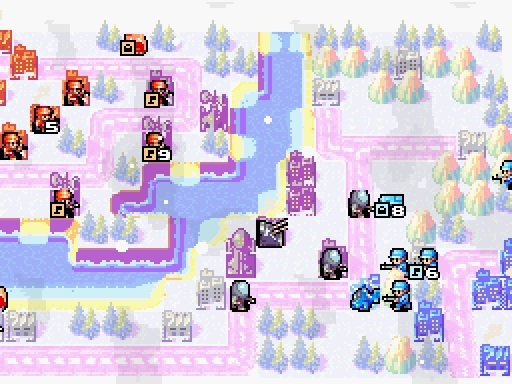 All in the balance – Advance Wars: Dual Strike’s battlefields are tactical puzzles to be picked apart. At the end of your turn you’ll be at the mercy of your opponent’s own moves. This back-and-forth of moves is incredibly absorbing. Advance Wars has that “just one more turn” pull. So much so that you can forget to step back and think strategically. Technically speaking, Advance Wars: Dual Strike is turn-based tactics, not high level strategy – this is not as complex as a PC heavyweight like Empire: Total War. Yet Intelligent Systems have created a game with depth. Dual Strike will punish tactical missteps and strategic errors. Although Chelsea-style “parking the bus” defensiveness can help you regroup, a few tactical blunders will lead to a quick defeat. My initial effort at this level: produce cheap Landers, load them with Orange Star infantry, and send them east to capture the neutral island. On another front, move tanks and artillery by road to hold the southern island. All I achieved through this brilliant strategy was to hand the match to the CPU’s Blue Moon army. What went wrong? The Landers were too slow in loading, moving, and unloading troops – by the time I had landed a few forces on the beaches, the computer-controlled units had already captured half of the eastern island and quickly set about pummeling the few people I had there. Lesson learned: transport helicopters are a faster option for landing troops. Advance Wars hooks you with the chance to learn from tactical mistakes, and improve with each game. Advance Wars: Dual Strike is probably not quite as good as its revered predecessor, Advance Wars (a Game Boy Advance title now available on Wii U Virtual Console), but it is near flawless. Dual Strike is truly brilliant bite-size gaming that packs in strategic depth and a broad range of options to be rewarding. As I ran through a few moves in Advance Wars: Dual Strike on my recent flight I thought that maybe I had passed a good twenty to thirty minutes. When I looked at my watch, I realized I had been playing for two hours. Few games can grab you like this – Advance Wars: Dual Strike is a phenomenal time sink. Thank you Intelligent Systems for making this plane trip easier! Advance Wars: Dual Strike is one of the greatest handheld games for a desert island, rainy afternoon, quick train ride, or a long-haul flight. Just remember to get up and stretch your legs.